Celery smells peculiar. This refinement of oil element has the effect of making them tidy in the mouth. It turns to the garnish of the oil dish. Moreover, when it eats the life by the taste of vinegar, the appetite improvement is effective. 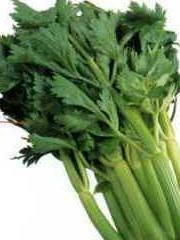 Celery is called "Netherlands MITSUBA" by the plant of the Japanese parsley department. In general, the medicinal effect is as high as parsley, and the minor component of the flavour compound of red-throated diver oil etc. is important in the plant of the Japanese parsley department. Additionally, there is potassium as a lot of included elements. There is a diuretic action in potassium, and is an effect of exhausting the sodium that becomes a cause of high blood pressure. There is a person hated by a peculiar smell of the plant of this Japanese parsley department. However, it becomes delicious if gradually becoming accustomed, and eating if eating. I became one of the very favorite vegetables while eating though I also thought no funny taste at first. A lot of vitamins B1 including the carotene, B2, C, E, calcium, and iron, etc. are contained though it is not quantitatively many in the element of celery. Vitamin B1 and B2 are effective to press metabolizing energy, and to maintain a normal working of the body. Comparatively a lot of vitamins U are contained in celery. It is said that the ulcer can be prevented by taking vitamin U. To take it efficiently, vitamin U will eat the life because it is weak to heat. The texture and the feature of celery are bitten feeling and peculiar fragrances. The volatile flux that erases stinky is included in this smell. Therefore, it has been used as a potherb of the meat dish. It might be use for which eating the stalk like the life made the best use of the texture. Therefore, it is the first to choose the fresh one. You may cook, and I think that you may stir-fry of celery. It is a vegetable with wide width of cooking. There are not only the Western food but also a miso soup etc. of a Chinese boiled food and the Japanese food and users. There is no place in which it throws it away because celery can eat the all. A fat, firm part near the root is used for the boiled food. The part of an axis, a leaf, and a twig near the leaf is made a salad by the life. Moreover, it is possible to parboil, to make to the oil stir-frying, and to use it as a potherb of soup, the stew, and the meat dish. How to use as the spice of celery. It might not be able to eat the leaf with a strong a lot of parts and smells of the stripe of celery that are as it is according to the person. Please use it for the smell erasing such as meats and levers at that time. Please finely chop and put it in soup if you enjoy smelling. The seed of celery smells similar to the stalk of celery and the leaf. The celery seed is the one that this was dried. It is possible to use it as a spice of the food cooked by boiling or stewing putting the flavor of pickles it. It is stocky, and let's be strong the smell and choose the one that the leaf is made fresh and green by thickness. Please choose a thing that is harder than a thing that is larger than an anyway small thing and a soft thing. Fresh one is also abundant nourishment. First of all, celery is cut in the leaf and the stalk. The leaf is preserved in the refrigerator putting the lap. Water is put in the glass a little, the root is done below, and the stalk is kept.